Baby goods retailer Mothercare says it is finalising a rescue deal with its creditors after years of falling sales and profits. The restructuring is likely to take the form of a company voluntary arrangement (CVA), which typically sees a retailer closing stores and renegotiating rents to prevent it from going into administration. It comes after the maternity specialist slashed its profit forecast in January and entered talks with creditors to avoid breaching the terms of its loans. So what went wrong at the 57-year-old chain, and can it turn its fortunes around? 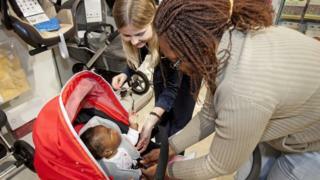 Stephen Springham, head of retail research at property consultancy Knight Frank, has been following Mothercare's progress for 20 years. He says even in the late 1990s the brand wasn't doing particularly well. "What's changed is the UK baby goods market has become much more competitive," he says. "A host of other firms are offering products at lower prices and Mothercare's range feels a bit outdated." When it comes to childrenswear Mothercare faces stiff competition from supermarkets that sell their own lines, such as Asda through its George range and Tesco through F&F. Fashion retailers Primark and H&M also now have popular babywear ranges, while Amazon and Argos dominate the toys market. This is partly why Mothercare's sales have fallen every year since 2012. But the retailer could have done more to help itself, says Kate Hardcastle, retail consultant at Insight with Passion. The mother-of-three was keen to use the chain after she gave birth a few years ago, but says she had a bad experience. "New parents want advice and support - whether they are buying a baby-grow for the first time or a bottle - and their sales assistants just weren't trained. "I also had a wider buggy for two children and I couldn't get it around the stores. I was really disappointed and I've talked to hundreds of other mothers who feel the same." She blames wave after wave of cost cutting at Mothercare over the last decade as it tried to remain competitive. She believes it could have adapted and thrived anyway, because of its strong legacy brand, but instead it "let go of what made it special". Like other High Street retailers that have got into trouble recently, Mothercare expanded at a rapid rate during better days but now has too many underperforming stores. Over the last four years it has reduced its store portfolio from 200 outlets to 137, but it's still struggling to pay its rents. "It has a lot of legacy stores which it signed up to on 25-year leases during the good times," Mr Springham says, "but those sorts of agreements aren't easy to get out of." Mothercare's rescue deal could go some way towards fixing these problems, he says, but the future will remain bleak if it can't fix its underlying issues. Some say the firm also needs to improve its online offering in the face of competition not just from Amazon, but also new internet marketplaces dedicated to baby goods. Ms Hinton says: "There's also so much opportunity to recycle nursery products online now, be it on Ebay or Facebook, which is a lot cheaper." Mothercare has been trying focus on e-commerce to offset falling footfall in its stores, and online now accounts for about 40% of its UK sales. But over the crucial Christmas period last year, online sales actually fell by 6.9%, despite heavy discounting in its end-of-season sale. The firm blamed technical issues which resulted in orders being delayed, and online revenue has since picked up. But Mr Springham fears the Christmas issues were symptomatic of deeper problems. "You can say it's a blip but in this day and age that shouldn't be happening during your peak trading period." Ms Hardcastle also thinks it raises red flags. "Online is time sensitive. Mothers need a new cot or a rocker quickly, and in a market where you can get things on time from the likes of Amazon they were seeing delays."